The 3100 series 80 grit abrasive safety track tape was engineered to exceed OSHA Standards - providing a durable, consistent non-slip surface. It is a commercial-grade anti-slip grit tape (sandpaper type) with adhesive backing, designed for most general-purpose applications. It is an excellent choice for most non-slip applications in both the home and work environments. Additionally, the use of silicon carbide anti-slip grit tape ensures longevity for indoor and outdoor applications. Long life, durable, and resistant to heavy traffic, water, and grease, you can't go wrong. Premium 80 grit silicon carbide non-skid safety track tape & treads for stairs, porches, decks, ramps, doorways, vehicles, platforms and more. AVOID SLIPS, TRIPS AND FALLS with these easy to install tapes. 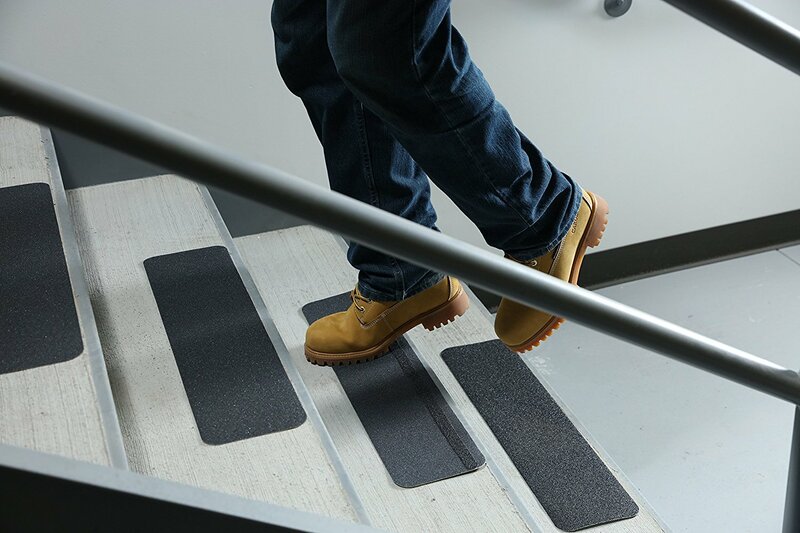 HIGH TRACTION surface indoors and outdoors that provides consistent anti-slip resistance. Aggressive adhesive for general purpose and longevity. For more detailed information regarding the 3100 series anti-slip grit tape, please don't hesitate to contact us - we're happy to answer all of your questions. Thanks for choosing Safe Way Traction as your trusted source for non-skid safety track tape! Roll widths available 1", 1.5", 2", 3", 4", 6", 12", 24", 18", & 24" with lengths varying per size. Pre-Cut Tread Sizes: 6" x 24"